NEW YORK (WABC) -- The MTA is expanding its use of countdown clocks in the subway system as part of a new pilot program unveiled on Thursday. 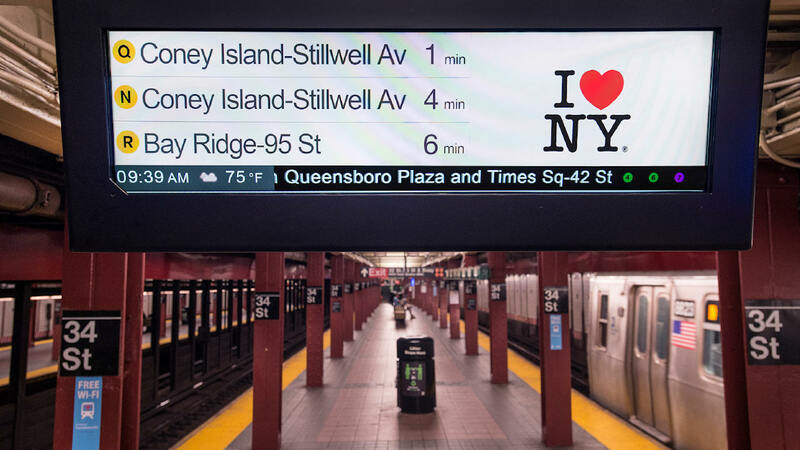 Governor Andrew Cuomo announced the new 90-day test period in which LCD screen countdown clocks will be installed in eight subway stops along the N, Q, and R subway line from 23rd Street to Lexington Avenue/59th Street. "These actions are the latest steps toward rebuilding and transforming the MTA into a unified, state-of-the-art transportation network that will meet the needs of current and future generations of New Yorkers," Governor Cuomo said. "With this new and updated technology, we'll help ensure riders have the information they need to get where they need to go." The new countdown clocks will rely on Bluetooth receivers in each station and in the first and last cars of each train set on the line to estimate arrival times. "Governor Cuomo challenged the MTA to develop an aggressive approach to putting countdown clocks on the lettered lines, and our technology team's response has been phenomenal," MTA Chairman Thomas Prendergast said. "In very short order they developed an easy to deploy, cost-effective system that we think will play a central role in bringing this essential service to more and more of our customers. We look forward to learning from this test, as well as to developing a roll out plan based on our findings." The new countdown clocks will eventually be installed throughout all 269 lettered subway line stations. There are currently countdown clocks in 176 stations along numbered subway lines, including the L line's 24 stations.